Activity: Tour Stadium. Services: Not guided stadium tour. Departure: Daily. From 10:30am to 19:00pm From April 01, 2018 to March 31, 2019 Not available on football match days or December 25, January 01. 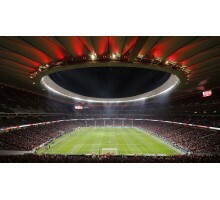 Duration: Free visit Starting point: Wanda Metropolitano Stadium - Av. de Luis Aragones, 4 Conditions: Cancellation fee: 100% for less than 24 hours notice or no-shows. A dream come true for the athletes and any football fan. The Museum of Atlético de Madrid & Pablo Ornaque Collection is an invitation to travel in time and travel in a way exclusive and different the triumphs of our team. Live with us, hand in hand with the best audiovisual material and an infinity of pieces of worship, of the past, present and future of a team who has written some of the best pages in the history of football. The Wanda Stadium Metropolitan awaits you. We want you to be part of this story too. PRICES SUBJECT TO OFFICIAL RATE REVIEW. The tour to the stadium may be suspended or modified totally or partially due to organizational needs, operational or sports without prior notice. In the case of being suspended, the entry that could have been been purchased in advance for another day. • Not available on football match days. • Clients will return to Hotel on their own. • Not guided tour in Stadium.